British Airways introduced buy on board meals in January 2017 featuring a menu of items provided by retailer Marks & Spencer. The move has been controversial in some quarters. 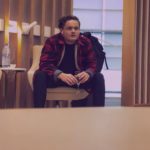 The airline is perceived to be the the flag carrier of the United Kingdom and as it has constantly marketed itself as a quality airline, people feel paying for food on board cheapens the brand. Buy on board food is offered to economy class (Euro Traveller) passengers on short-haul flights within Europe. European business class (Club Europe) and all long-haul flights in all classes continue to feature complimentary meals for all passengers. The menu is printed as a high quality booklet featuring an excellent selection of pictures of what is available. Accompanying the pictures is text featuring descriptive words such as “brilliant”, “satisfying”, “nibble”, “peckish”, “fuss-free” and more. See it for yourself. It will be interesting to see how long the menu continues to be printed so well. No doubt they won’t be cheap to replace when torn or liberated from the seat pocket. Many airlines offering buy on board have the menu in the back of the in flight magazine. The layout doesn’t feel particularly intuitive to me. It opens with a bacon roll so I assumed breakfast item, then snacks, then sandwiches which is presumably lunch, a salad (dinner? ), then breakfast items, fruit and finally sweets. Personally, I would turn the page expecting to see breakfast items, lunch, dinner, snacks and so on. It is also unclear whether certain items are only available on certain flights. I read somewhere that someone asked for a breakfast item on a late flight and was told it was not available as it was not morning. This is not mentioned anywhere in the menu which is unfortunate if true. The menu gives the impression everything is available all the time. An impressively designed menu for a very good selection of on board snacks, I think you will agree. What do you think of the menu offered? Have you seen better or worse? I’d love to hear your comments and questions so please leave them below. 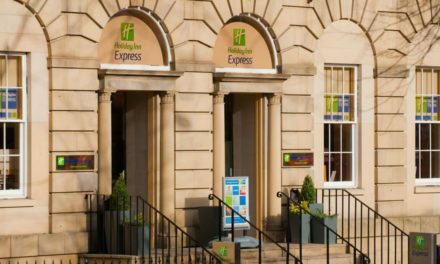 Review: How Surprising Is Holiday Inn Express Edinburgh City Centre? We recently flew from Sydney to Melbourne on Qantas and was thoroughly surprised by the free inflight entertainment (an iPad no less!!) and FREE food and drink!! Completely unprepared for this as I was expecting nothing more than what you get flying cattle within Europe, i.e. Nothing! Do a nice surprise. 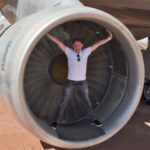 I completely agree – everything is free on board when flying Qantas. Some of the aircraft have screens in the seat backs, others let you use Q Streaming and you can stream to your device. The service is very good! The Economy Class food is also really nice and quite decent. So it’s a very different experience to most of Europe! Thanks for the comment! Nice looking menu and lots of choices. I agree with your view on the sequence.